When you set out to buy a car battery how do you know you are getting a fresh one? 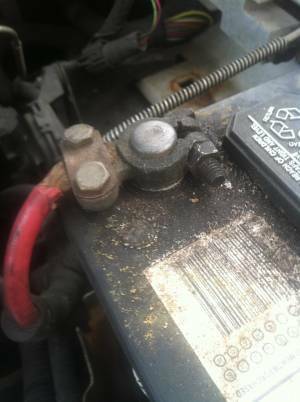 As a rule of thumb, I won’t buy a car battery that has been sitting on the shelf for more than 3 months. With car batteries freshness counts. Most car owners are going to buy a new battery every 3 to 5 years, but if you got a battery that has been sitting on the shelf for 6 moths or more…well you get the idea. 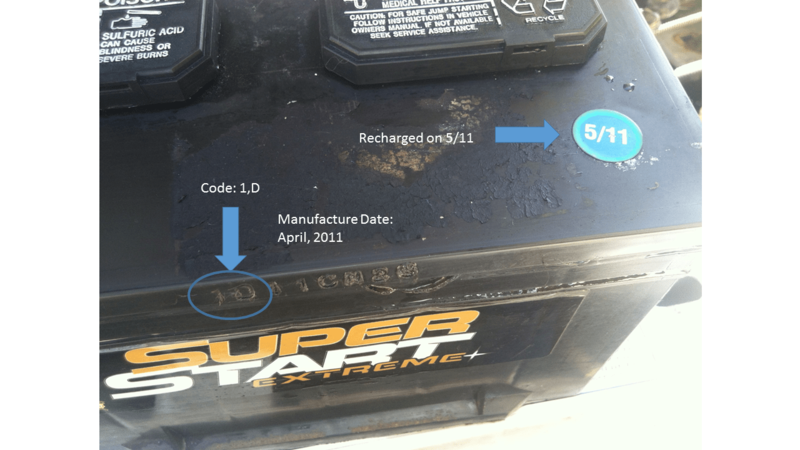 How To Understand The Date Code On A Car Battery. 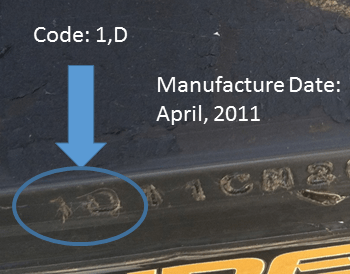 Most all major car battery manufacturers will have some form of the same code to signify the manufacture date. You can find the code engraved into the plastic top in a corner or on the side of the top. Here’s an image of the code on the side of the top. So here’s how to interpret the date code. The code is 1,D. Almost always the first letter stands for the month, and the first number stands for the year. The order can be reversed. In this case we have the number 1 which stands for 2011, and D which is the fourth letter in the alphabet, so D corresponds to April. A = Jan, B = Feb, C = March, D = April, etc. and 0 = 2000, 1 = 2011, 2 = 2012, 3 = 2013, and so on. It is also interesting to note the sticker on the top. What this means is the battery was probably recharged in May 2011. When I bought this battery in May, it was already 1 month old. This is important information if I wanted to claim any warranty of the battery. Although I count freshness as the number one consideration when buying a car battery, there are other important ratings to consider as well. I found this great article listing important ratings and what it all means. It’s a good read you can find it here. It’s By Marlan Davis on Hot Rod Magazine. Here’s a helpful video to equip you with superior knowledge when buying a car battery. Hopefully, when buying a car battery this post will help you get the freshest car battery on the self. After all, like many things in life, car batteries do have a shelf life. It has to do with the chemical processes inside. The car battery actually starts aging the moment its filled with electrolyte. While your out buying batteries why not also consider a personal jump starter? They can get you out of jam and provide you with peace of mind. I think it’s just a good idea. Here’s one that I really like. It’s the MicroStart PPS X-1 by Antigravity Batteries. One last thing…please like and share this post. I would be eternally grateful to you!